Star Wars #53 ratchets up the tension as the Rebels struggle to survive the Imperial onslaught. Just as they make some headway, they’re faced with another insurmountable obstacle. Leia decides to take on the challenge, but how many will die trying to help her? There’s a ton of action and suspense in this issue as cruisers blow up left and right and the Rebels trying everything they can to fight back. With Vader in the fray, it’s no easy task. All the action leads to some interesting scenes. 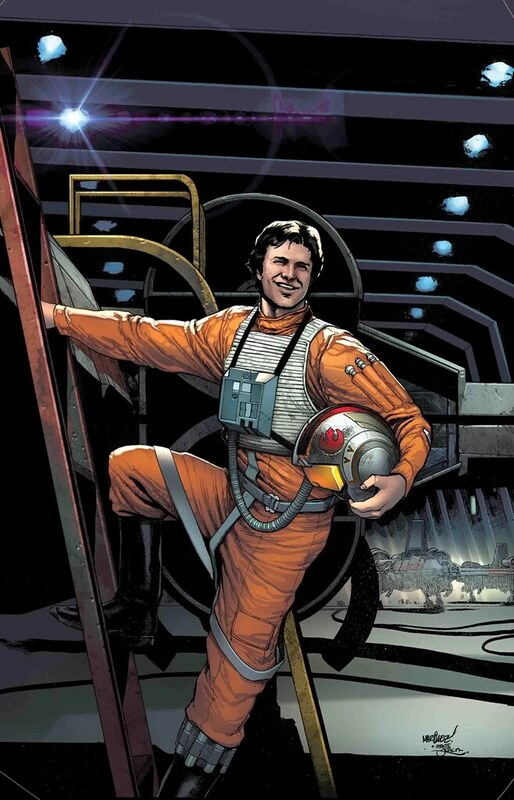 From Han landing the Falcon upside down, to the reflection of Vader’s TIE in Leia’s eyes, the artwork is top notch. Salvador Larroca really pulls out the stops to present some gorgeous panels in this one. The story is pretty frantic throughout. Basically it’s a struggle for the heroes to make headway. They can’t talk to each other, so they have to think outside the box to spread the message. So far the only thing they have going for them is a way to scramble their fighters. However, eventually they do make some progress…of sorts. They find there is an override code, but it’s located on the Imperial super star destroyer. This of course leads to a suicidal mission to infiltrate the ship and get the code. Leia leads the charge and Draven follows her in. Unfortunately for them, Vader is on their trail. Gillen does a great job with the story. It’s tense, dramatic and frantic. The artwork does a great job of reflecting and channeling the emotions. Whether it’s the arrangement of the panels and the scenes, or the emotions on the characters faces, Larroca captures the feelings and super charges the story. It comes together in a way that makes you question whether the heroes can win, even though we all know how this story ultimately ends up. That in itself is a mark of great storytelling, in this case from both the visual and written word. It melds together and pays off. With great writing and artwork, Star Wars #53 scores high marks. I give it a five out of five metal bikinis. Hopefully we’ll get to see with the anti-Vader drill is in the next one.